Hello everyone! Today, I have a quick and easy DIY project to share with you using Julianna's Jewel Loom™ and it's sure to bring a little beauty to any room in your home. I made an infinity band using the Jewel Loom™ and two hole Czech Glass Tile Beads in Light Purple and Pink Peacock with Vitrail finish. Then I wrapped the band around a votive candle holder and glued in place. Then I added some flower with a little sparkle of glitter, some tiny acrylic pearl flowers and purple crystals for the center. Here is a close up of the band. These beads are so pretty and they work perfectly for a project like this because they lay flat. Did you know that Julianna recently opened an Etsy store? Her store is filled will beautiful beads like this, wire, crystals, and the Jewel Loom kit -- it's even signed by Julianna! You can click HERE to visit Julianna Casa de Jewels Etsy Shop. Don't forget to check out Juianna's Jewel Loom Facebook Page and the Positively Me Blog! Hello everyone! 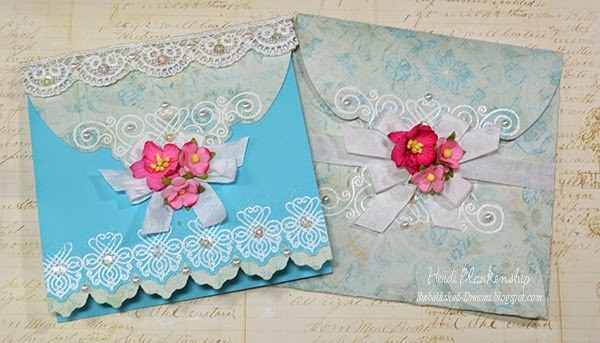 Today, is my day to post for The Stamp Simply Ribbon Store and have a Prima Princess card to share with you. I also used the letterpress technique to create some beautiful vintage brocade pattern ribbon. 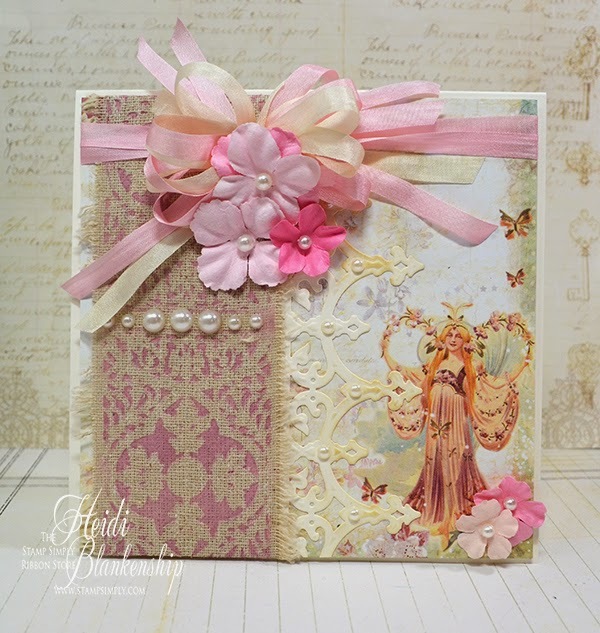 Here is the card I designed using some of the wonderful paper from the Prima Princess 6 x 6 Paper Pad. I just love this paper pad--the colors are so soft and dreamy looking and they have some beautiful images. Check out the ribbon on the left side of the card. This is the May Arts 2.5" Cotton Blend Vintage Print - Plain and then I did the letterpress technique with one of the die templates and some ink. Love how this turned out! To do the letterpress technique I used a Speedball Brayer and some Mix'd Media Inx Chiffon. I inked up the brayer and then I rolled it over the top of the die template. The ink is on the raised up ares--this is the area where the pattern will be embossed into the ribbon. Carefully tape the die templates face down on to the ribbon and cut/emboss. Here you can see a close up of the ribbon. After I cut/embossed this piece I frayed the edges of the ribbon a little more and then I added a few pearls. 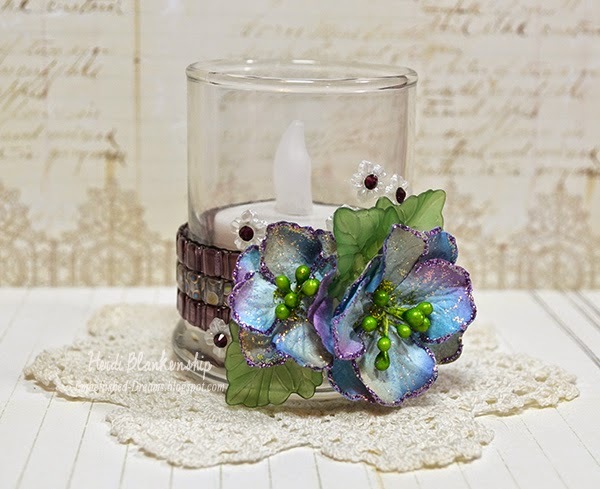 I love how vintage, shabby, and romantic this looks and the ribbon is so soft too. I also used GLLD-001 Petite Monarch die template to cut/emboss the pretty decorative border. Then I lightly inked the edges with Tim Holtz Distress Ink-Antique Linen and added a few pearls. 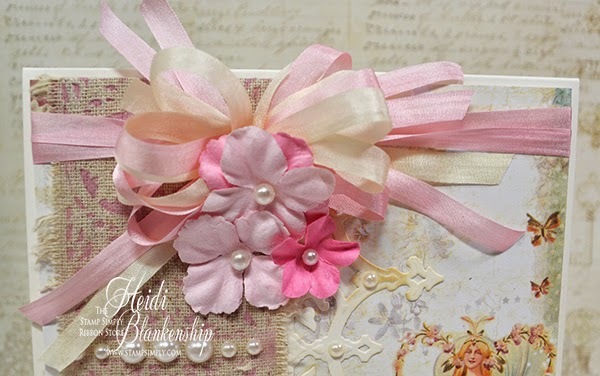 To finish off the card I made a bow using May Arts Pink Silk, Ivory Silk ribbons and added some Prima Abbey Pink Flowers. 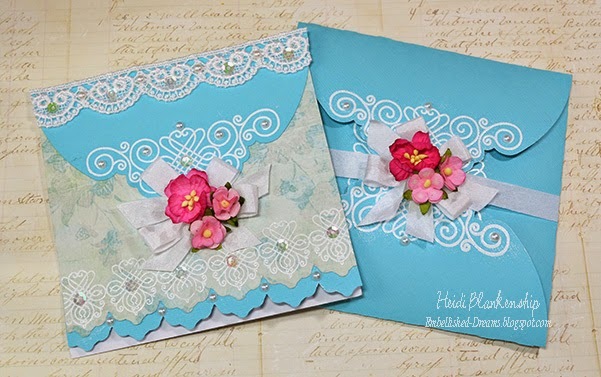 I hope you enjoyed the card and mini tutorial today and I hope you will try to alter some of your ribbons with the letterpress technique. It's fun and easy to do and completely changes the look of the ribbon. As always you can click on all the photos to enlarge them and all of the supplies are listed below with links. Hello everyone! It's time for Tutorial Tuesday for JustRite® Papercraft and today I will be sharing the first video in a series doing watercolor techniques. In this first video I will be showing you how to do four different watercolor techniques. The first technique is using Distress Inks and a square acrylic block. The second technique is using Distress Markers and a rectangle acrylic block. For the third technique I used Distress Inks and layers of water drops to remove some of the ink. The layers of water drops in this technique give the look of Bokeh which is very popular right now. For the forth technique I used Distress Inks and share how to create a watermarked using a background stamp. If you would like to find out all of the details on each of these techniques and see a full step-by-step tutorial and a video tutorial you can hop on over to the JustRite Inspiration Blog or you can click HERE to check out the video. But don't forget to visit the blog for a great giveaway! 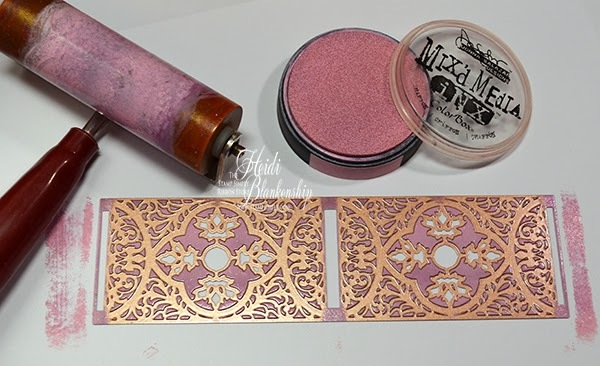 Here are the details on the Giveaway over on the JustRite Inspiration Blog. 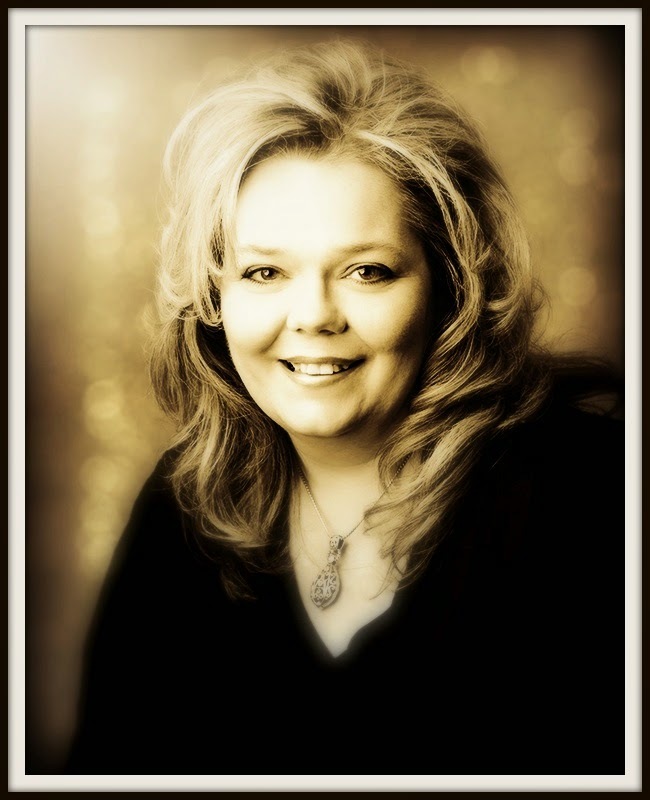 For this week's Tutorial Tuesday Giveaway one lucky winner will a $30.00 Gift Certificate to our website. Simply answer today's two giveaway questions. Have you used a watercolor technique to make a project? If so what is your favorite product to use for watercolor techniques? Hello blogging friends! I hope everyone had a great weekend. Summer is coming to an end and that means school is just around the corner. I know in different areas some of the kids are already back in school. So went went school shopping this weekend. Something totally different for us--in the past it was just uniforms. This will be Evan's first year in public school and the first year at the Jr High. The private school he went to only went up to sixth grade. So this will be a year with a lot of new experiences. For today, I have a decorative pin/brooch to share with you. 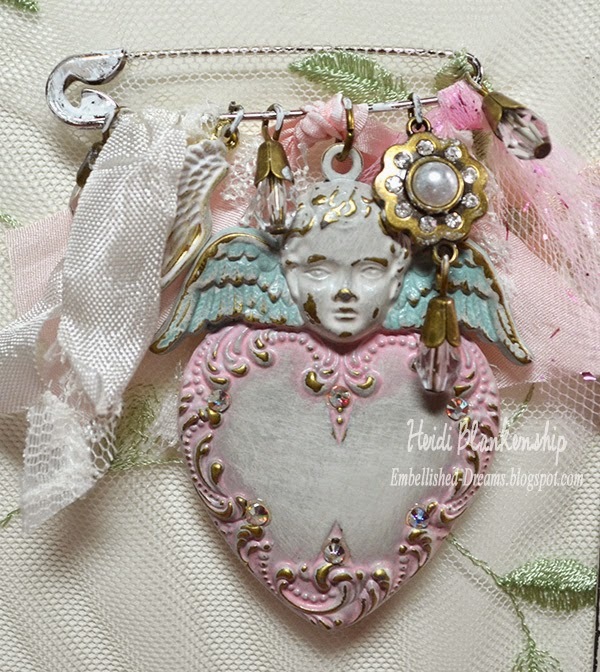 I used one of the Spellbinders® pendants GL2-001 Heart Angel-Gold by A Gilded Life. 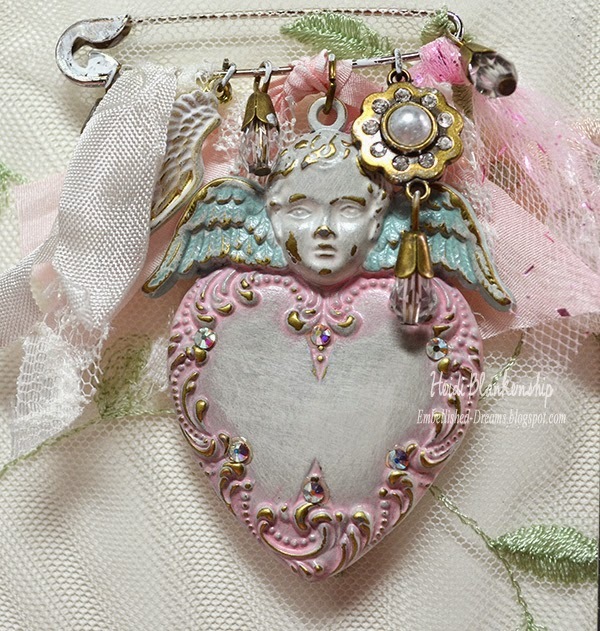 I painted the pendant white and then I added some details with pink and blue paints. Next, I buffed the pendant with steel wool until some of the paint was removed and the gold metal was revealed. 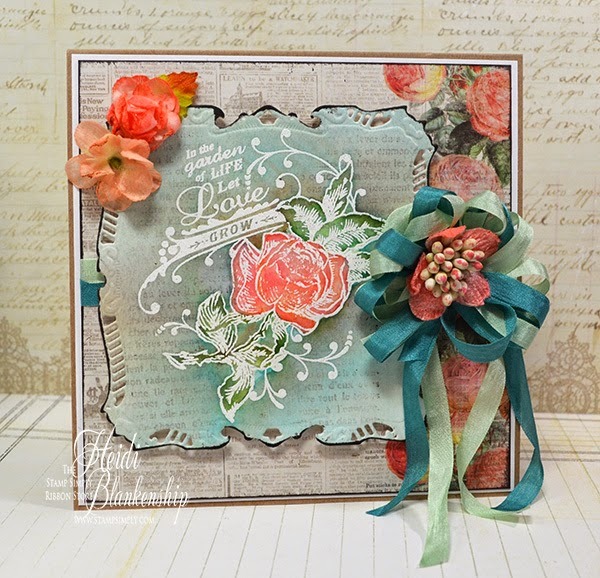 I absolutely love this look--is so pretty and shabby! I added the pendant to a very large safety pin. I used gesso on the pin to tone down the silver and give it a more shabby look. Then I added some charms, crystal dangles, ribbon, tulle and lace. I also added some AB crystals to the heart on the pendant. This is such a quick and easy project and would make a lovely gift. Hello everyone! Today I have the second baby card to share with you. It's a bundle of joy little boy card. Here is the card that I designed. I just love this image with the stork--it's so adorable! I stamped the image on to white cardstock using Memento Espresso Truffle ink and then I colored the image with Spectrum Noir Markers. All of the markers I used are in the supply list below. 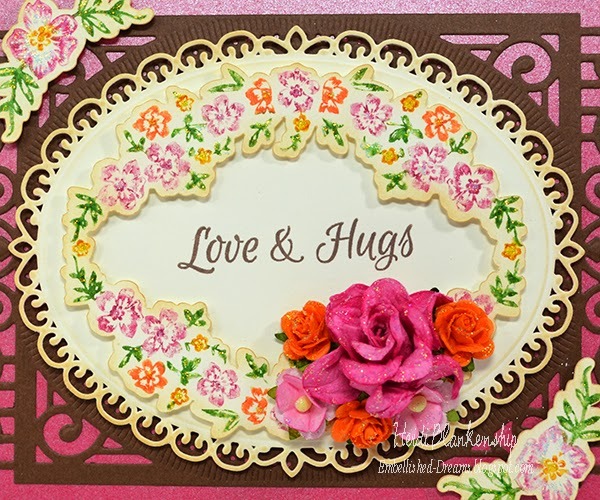 I used S5-127 Labels Twenty-Eight from Spellbinders Paper Arts® to cut/emboss the label shape. Here is a little silver baby rattle charm I attached to the side of the card using May Arts Silver Metallic String. To finish off the card I used S6-010 5 x 7 Heirloom Legacy and S6-001 5 x 7 Matting Basics A die templates to create the decorative layers and mat for the card. I inked Tim Holtz Distress Ink Broken China ink on the outer edges of the blue cardstock. I used 3D Foam Squares and EZ Runner® Permanent Strips-Refillable Dispenser 49' from Scrapbook Adhesives by 3L® to adhere and layer all of the pieces together. Then I added a few Melissa Frances White Pearls. 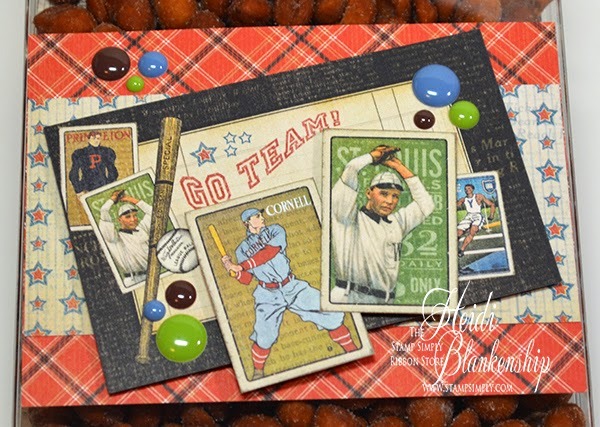 I hope you enjoyed this sweet baby boy card and thanks so much for stopping by today! Hello everyone! Today and Tomorrow I will be sharing a couple of baby cards with you. I recently made these cards for my mom to give to a couple of her friends who are new grandmas. I have a sweet baby girl card to share with you today. 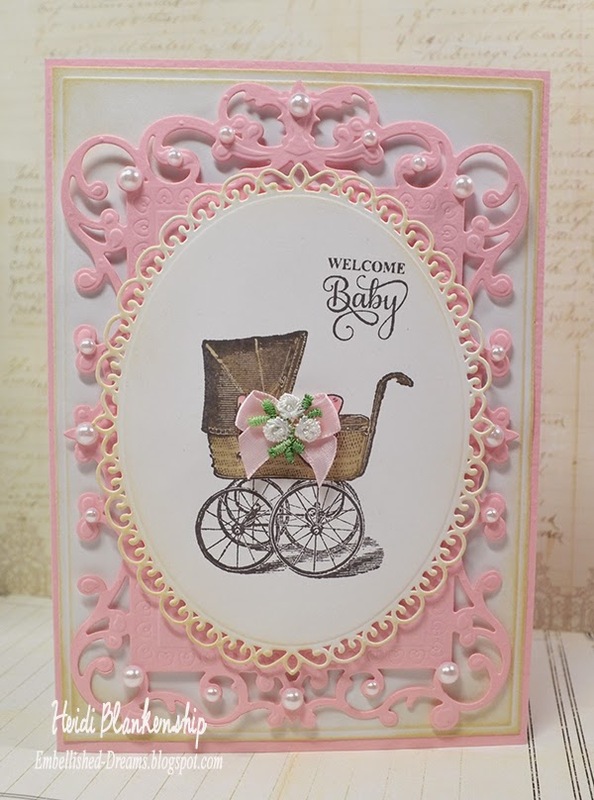 To start I used a baby buggy and sentiment stamp from the CR-04810 Bundle of Joy Vintage Labels Five Clear Stamps from JustRite® Papercraft. 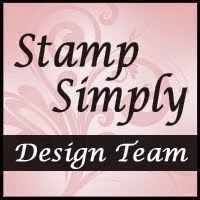 I stamping the images using Memento Espresso Truffle ink on to white cardstock. Then I colored the image with Distress Markers-Antique Linen and Spun Sugar. Even though I was going to be covering up the bow on the image I still wanted to color it with the Spun Sugar marker because I knew a little bit of it would still be peeking out. Next I used S4-425 Elegant Ovals to cut/emboss the decorative shape and then I inked the edges with Tim Holtz Distress Ink Antique Linen. I made a couple more die cuts using S6-011 5 x 7 Reflective Moments and S6-001 5 x 7 Matting Basics A die templates from Spellbinders Paper Arts. Once all of the pieces were die cut I used 3D Foam Squares and EZ Runner® Permanent Strips-Refillable Dispenser 49' from Scrapbook Adhesives by 3L® to adhere everything together. Here is a close up of the baby buggy. 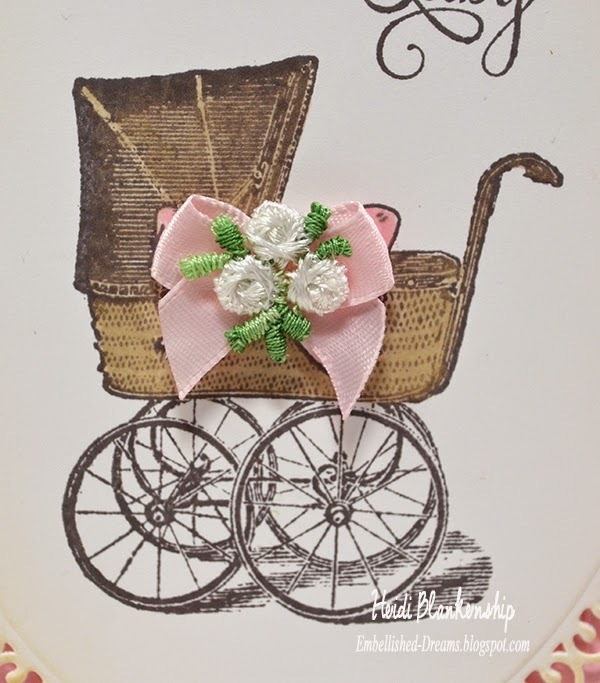 I added a Pink Bow and a White Floral Applique to the image. 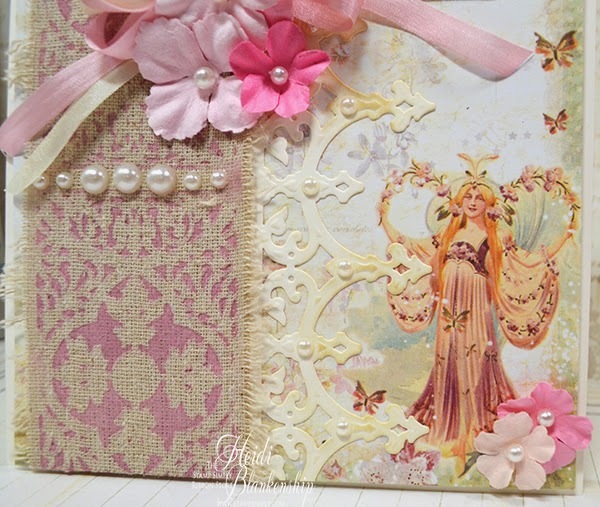 To finish off the card I inked the edges of the white mat die cut with Tim Holtz Distress Ink Antique Linen and then I added a few Melissa Frances White Pearls. I hope you enjoyed the baby girl card today. Tomorrow I will have a baby boy card to share with you. Thanks so much for stopping by today! Hello everyone! 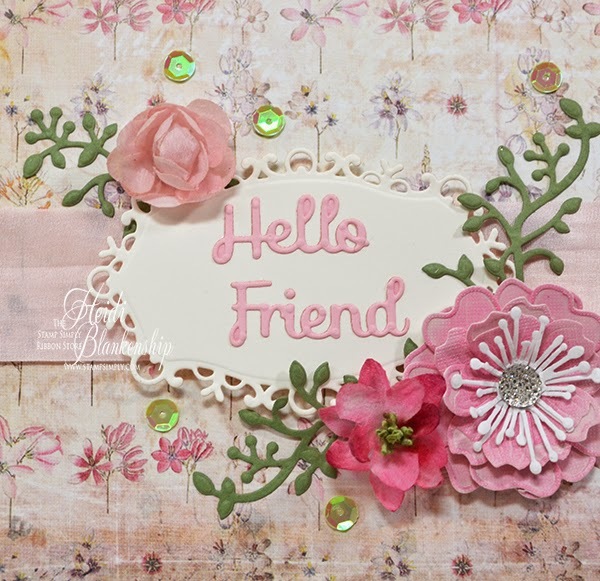 Today, is my day to post for The Stamp Simply Ribbon Store and I have a floral Hello Friend card to share with you. This was one of those cards where everything just came together so nicely. 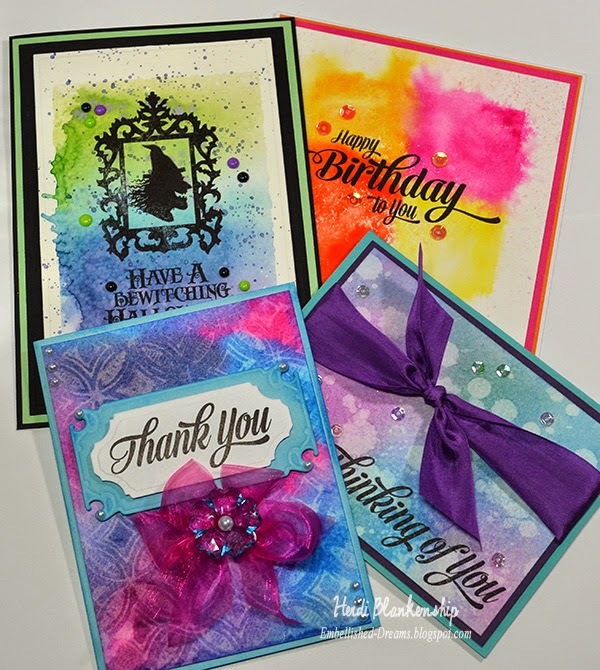 I started with the beautiful piece of paper from the Prima Princess 6 x 6 Paper Pad. 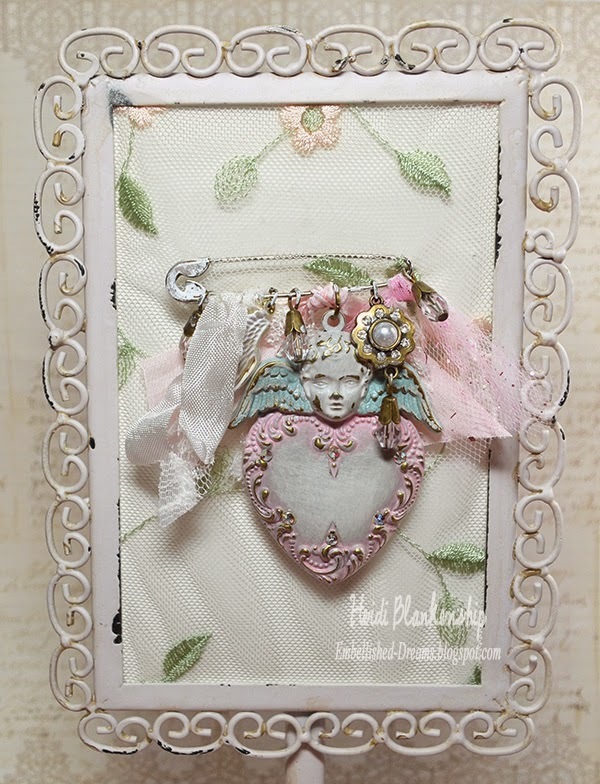 I used a pink mat and added some May Arts Pink Silk Ribbon and then added this to a ivory card base. Then I created a few die cuts using S2-099 Fancy Labels Tags One, S2-049 Corner Sprigs, IN-037 Celebrations Two, S2-046 Blooms Three die templates from Spellbinders Paper Arts®. 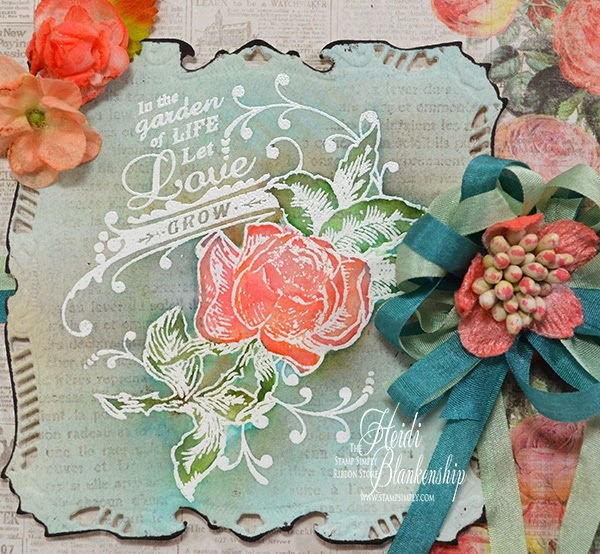 I used ivory cardstock for the label shape, pink for the sentiment and largest flower, and green for the springs. I added a Kaisercraft-Sparklets Crystal to the center of the largest flower. After the die cuts were done I started to assemble and layer all of the pieces and the card came together in a matter of just a few minutes. Gotta love it when that happens! To finish off the card I added a couple of flowers from the Petaloo-Botanica Pink Minis and some Webster's Pages Party Time Sequins. I hope you enjoyed the card today as much as I enjoyed creating it. As always you can click on all the photos to enlarge them and all of the supplies are listed below with links. Hello blogging friends! 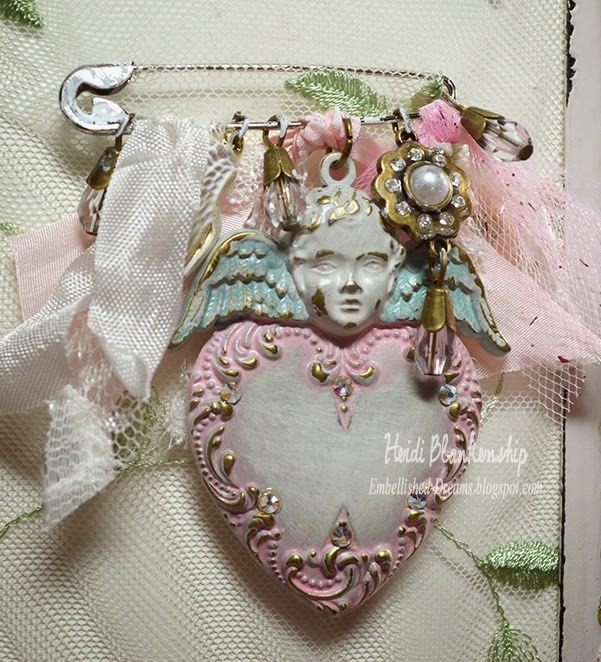 Today, is day four of the Spellbinders 12 Days of Christmas Blog Hop. 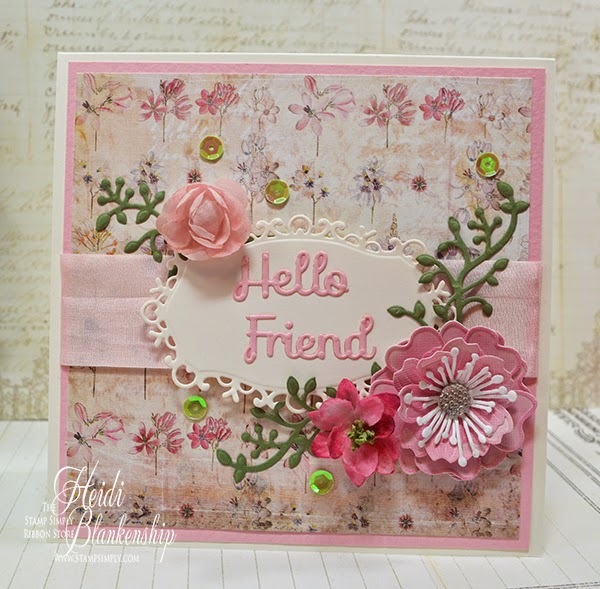 I have a couple of projects along with a tutorial to share with you over on the Spellbinders Blog. Here is a peek at the card I designed using one of the New Christmas die templates sets from Spellbinders. 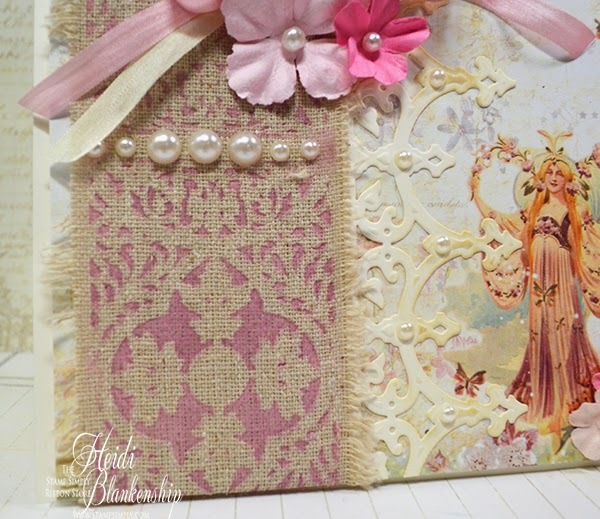 I have a full step-by-step photo and text tutorial on the Spellbinders Blog. For my second project I dressed up and altered a white gift bag. If you would like to find out all of the details and see more photos hop on over to the Spellbinders Blog! There is also a giveaway--you don't want to miss out on that! Hello everyone! 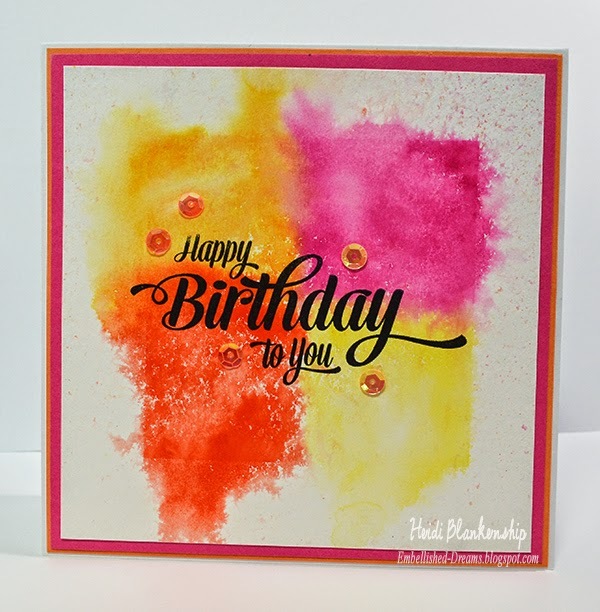 Today, is my day to post for The Stamp Simply Ribbon Store and I have a beautiful watercolor card to share with you. Watercolor is so popular right now and the wonderful thing about it is that you don't have to be an expert to do it and it takes just a little bit of practice. Watercolor is so free flowing and if your colors happen to go out of the lines a little that's ok, it still looks beautiful. It's also a lot easier then most people think so if you have been wanting to try watercolor but just haven't done it yet I encourage you to give it a try. Here is the card that I designed. 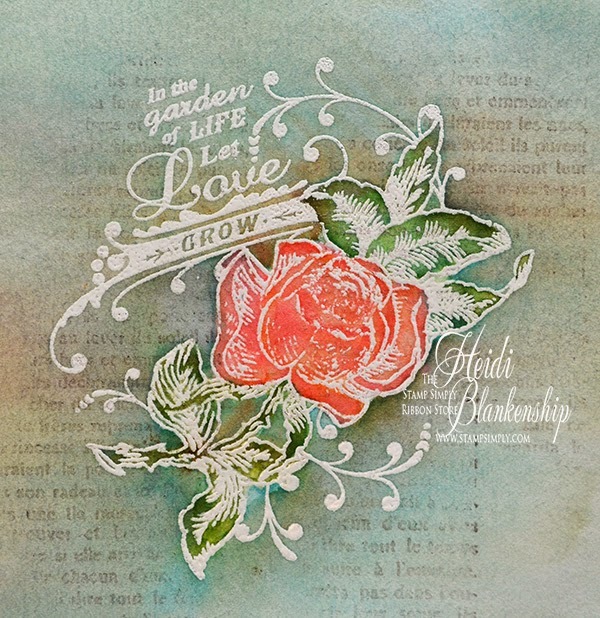 I stamped the rose image from JustRite® Papercraft CR-02112 Hope and Love Vintage Labels 8 and 9 Clear Stamps using VersaMark Watermark Ink on to the Ranger Watercolor Paper. 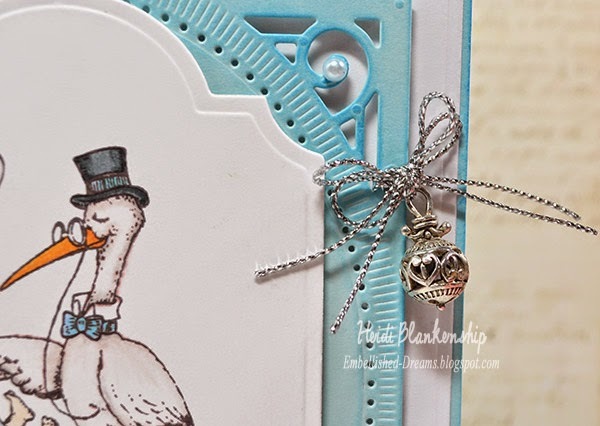 Then I heat embossed using Stampendous Super Fine Embossing Powder - Detail White and a heat tool. To create my watercolors I used Tim Holtz Distress Inks-Worn Lipstick, Wild Honey, Peeled Paint, Pine Needles, Broken China, Vintage Photo. Press the ink pads on to a craft mat. 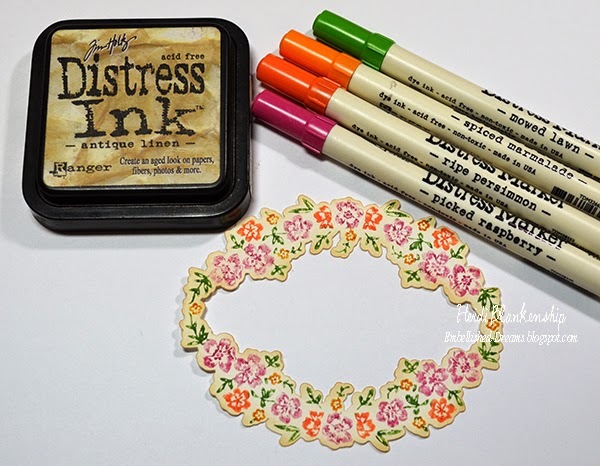 If you don't have a craft mat you could use a variety of things such as--a foam plate, a regular plate (the ink will was off), wax paper, and freezer paper. When the image is heat embossed the embossing will help to hold the watercolor in place for you. So if you are new to watercoloring you might like this technique and feel a little more comfortable with it. I started coloring the rose first, coloring one petal at a time. I wet the paper first with water and only wet the area I was painting. Wetting the paper will allow the watercolor to flow more freely. For the rose I used Worn Lipstick and Wild Honey. One the leaves I used Peeled Paint andPine Needles. For the background color I used Broken China and Vintage Photo--starting with the Broken China first. You can also use a heat tool to set and dry your watercolor in between the layers of color. After all the watercolor was done I still wanted to add some interest to the background of the paper and I was also trying to match it up to the patter paper I used on the card. 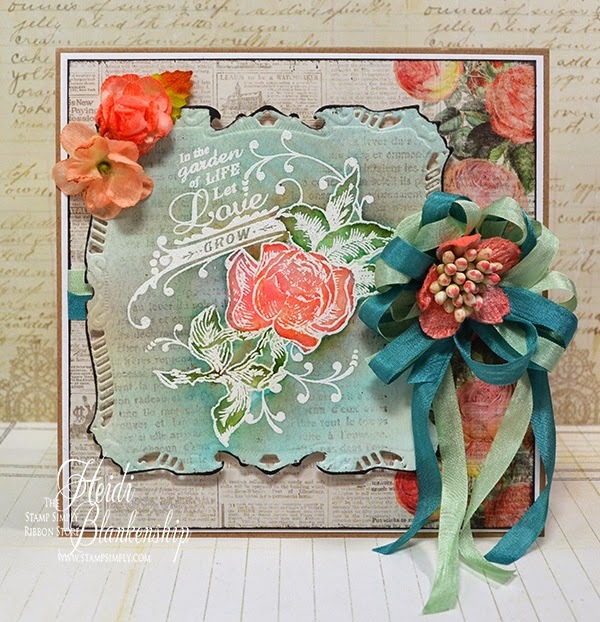 I used the CL-04355 French Rose Background Cling Stamp from JustRite® Papercraft and I inked up only the text area on the stamp with Momento Espresso Truffle ink. Then I stamped once on some scratch paper and then stamped again on the watercolor paper. Doing this gave me the lighter color of ink. I randomly stamped the text a few times on the background. 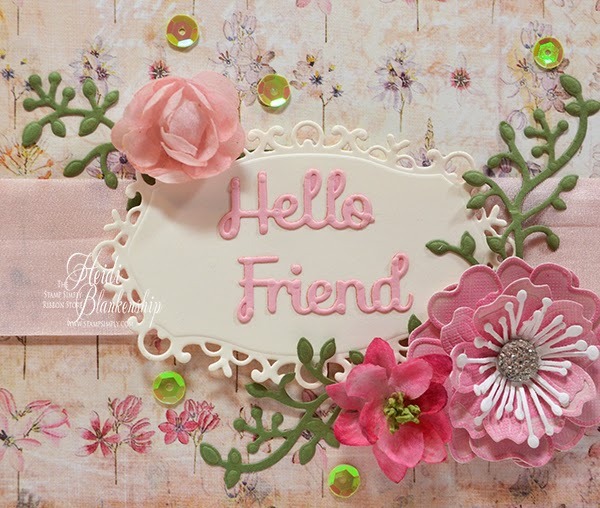 I used S4-422 Majestic Squares die template from Spellbinders Paper Arts® to cut the decorative shape. Then I inked the outer edge with Momento Espresso Truffle. Here is a close up of the watercolored image. 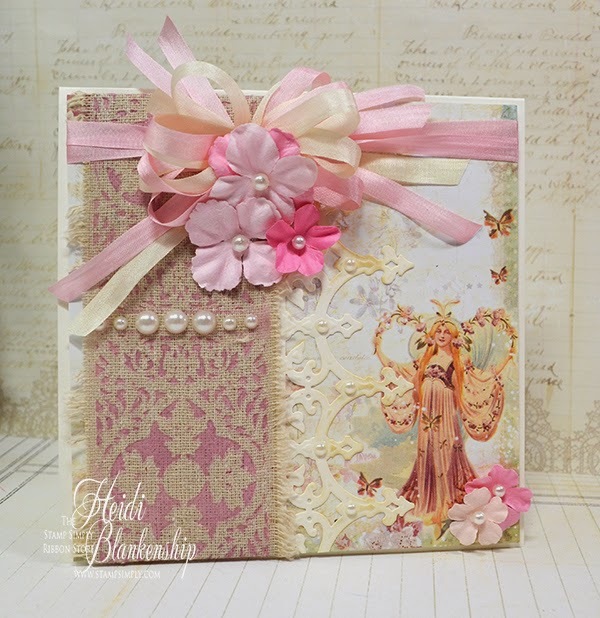 To finish off the card I used some beautiful paper from the Prima-Something Blue 6 x 6 Paper Pad, Petaloo Botanica Minis Collection Coral and Teal, Mint Green May Arts Silk Ribbon to create a pretty bow. I hope you enjoyed the card today as much as I enjoyed creating it and I really hope you will give watercoloring a try. :) As always you can click on all the photos to enlarge them and all of the supplies are listed below with links. Hello everyone! 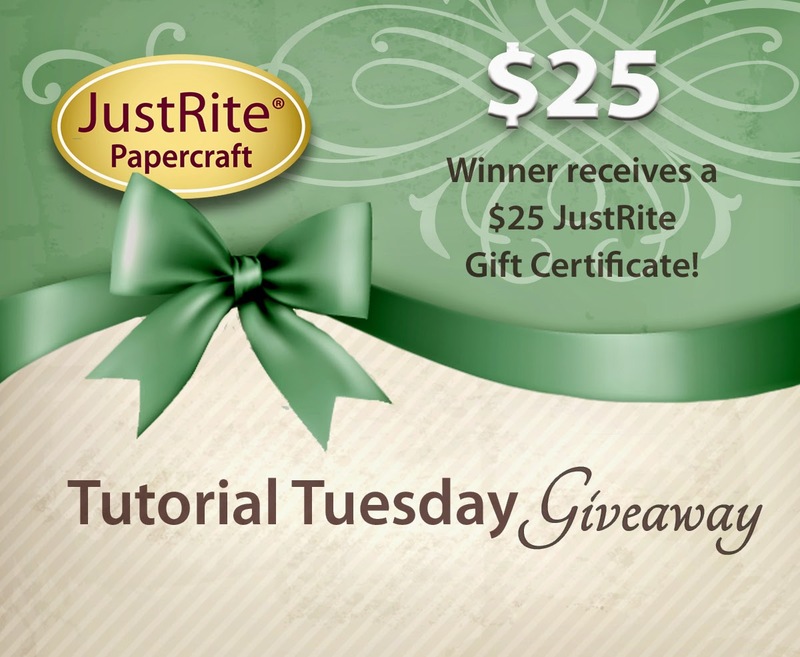 It's Tutorial Tuesday with JustRite® Papercraft today and I have a beautiful card and matching envelope set to share with you. 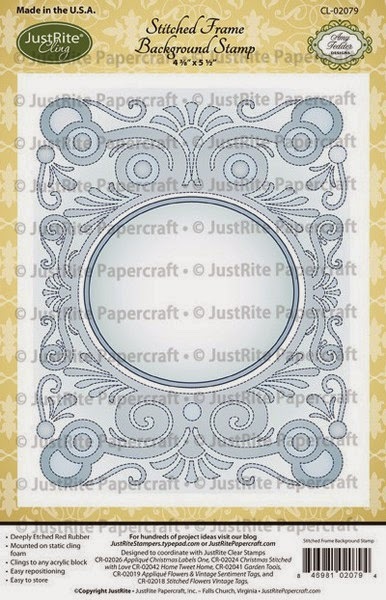 I used SVG-02112 SVG Elegant Stationery Elements Cut File Digital Download and CR-02091 Elegant Fan Elements Clear Stamps. I created two sets by first cutting everything with a solid colored cardstock and then again with pattern paper and alternating the pieces in the sets. For all of the details and to see more photos please hop on over to the JustRite Inspiration Blog or you can check out my video tutorial by clicking HERE. Simply answer today's giveaway questions - We would love to know in your home where do you craft? By the TV in the living room ,at your kitchen table or in a craft room? 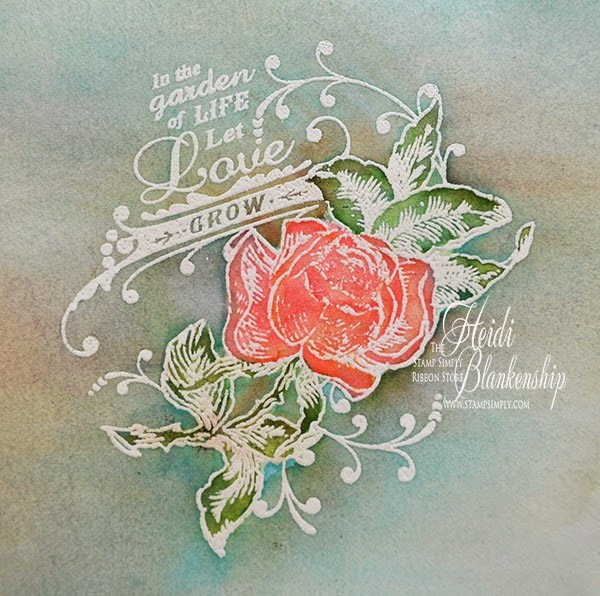 Simply leave a comment HERE (On the JR Inspiration Blog) or on Heidi's Video. Hello everyone! 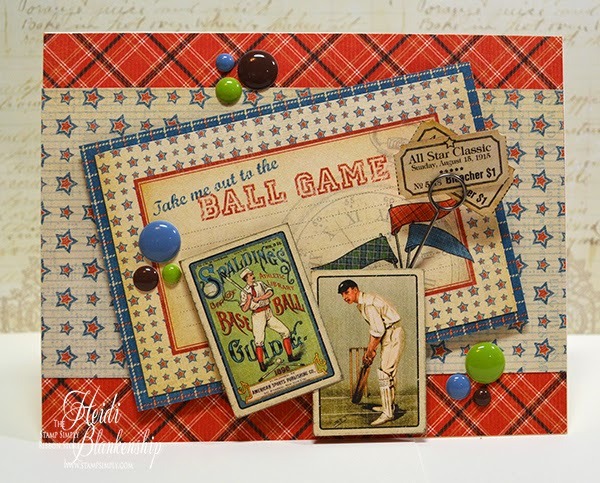 Today, is my day to post for The Stamp Simply Ribbon Store and I have a fun, quick and easy masculine project that would be a great gift idea for the man who loves sports. I love it when a project comes together so easily and whenever I work with the Graphic 45 papers that seems to happen. The papers are so fabulous to work with! For this project I used several different sheets of paper from the Graphic 45 Good Ol' Sport 8 x 8 Paper Pad collection. I just did some fussy cutting, layering and adding a couple of embellishments and it was done. Here is a look at the card. I used ivory cardstock for a base and all of the papers came from the paper pad. 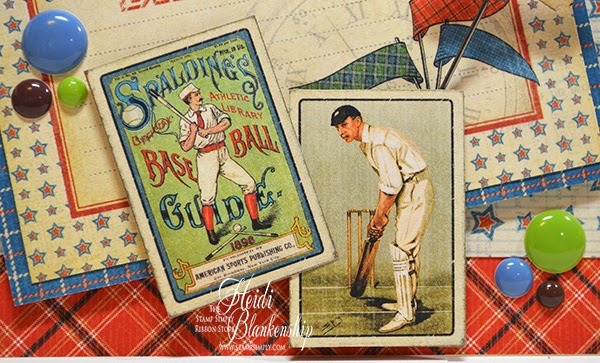 I fussy cut a few of the smaller images and the tickets. Then I used 3D Foam Squares and EZ Runner® Permanent Strips-Refillable Dispenser 49' from Scrapbook Adhesives by 3L® to layer all of the pieces. 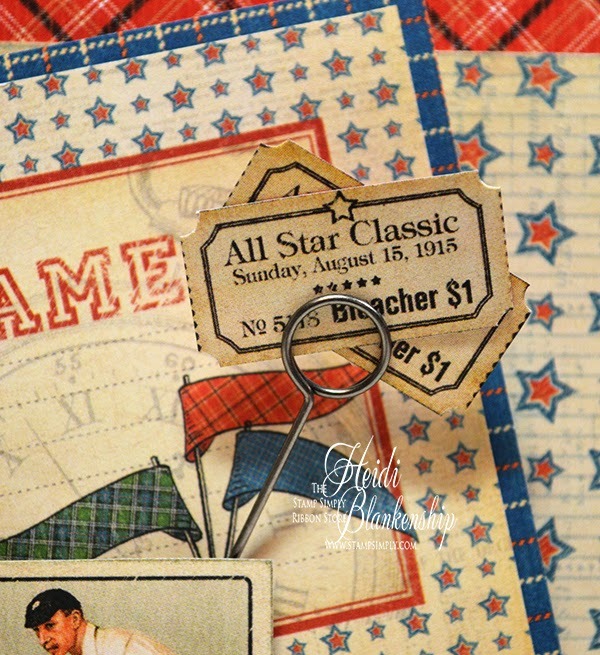 I fussy cut two of the tickets and then used a Tim Holtz Idea-ology Memo Pin to hold them in place on the card. Here is a little tip--when fussy cutting tickets used a round hole punch to punch of the corners and then trim the sides. Doing this will give you nice clean and crisp corners and using the hole punch is a lot easier then trying to do that with a scissors. Here is a close up of the couple of the images. 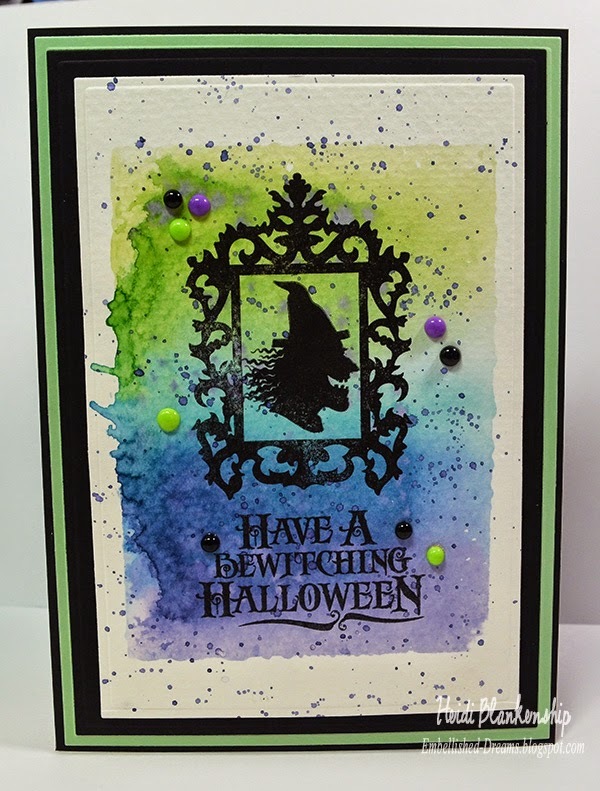 To finish off the card I added a few Prima Sugar Dots-Allstar for embellishments. Here is the box of peanuts. I used one of the Crystal Clear Boxes - A6. I cut a piece of the pattern paper to fit on the inside of the box for a more finished look. You can see just a little bit of the paper peaking through at the top of the box. Using the same papers as I did fro the card I fussy cut and layered the paper and the images and added this to the front of the box. I also added a few more of the Prima Sugar Dots-Allstar for embellishments. 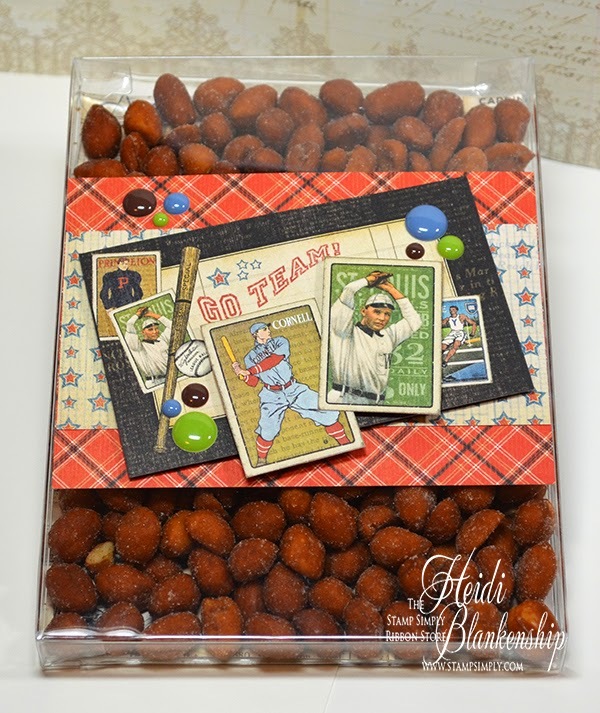 Then I filled the box with honey roasted peanuts. 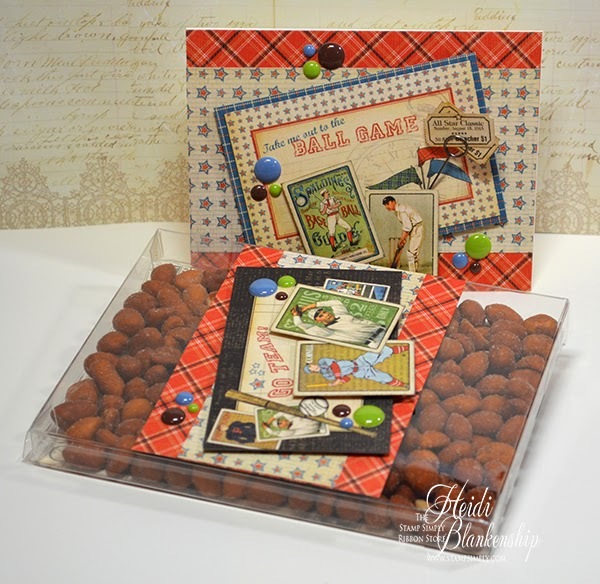 I hope you enjoyed the card and peanut gift box today as much as I enjoyed creating it! This is a great little gift idea for a man and using the Graphic 45 papers makes it so easy! As always you can click on all the photos to enlarge them and all of the supplies are listed below with links. Hello blogging friends! 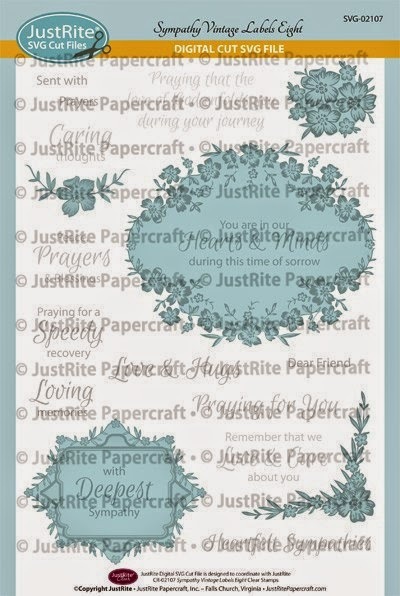 Today is day four of the JustRite® Papercraft New Release for August and this is our last day of the release too. For today we have one stamp set with a coordinating SVG File and a Background Stamp to share with you. 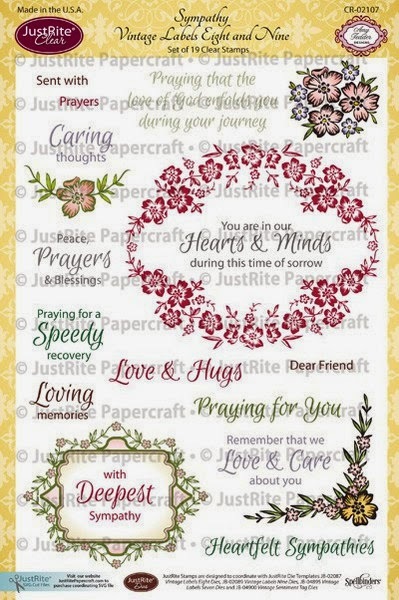 Here is the card that I designed using CR-02107 Sympathy Vintage Labels Eight Clear Stamps and SVG-02107 SVG Sympathy Vintage Labels Eight and Nine Digital Cut File Download for CR-02107 from JustRite® Papercraft. 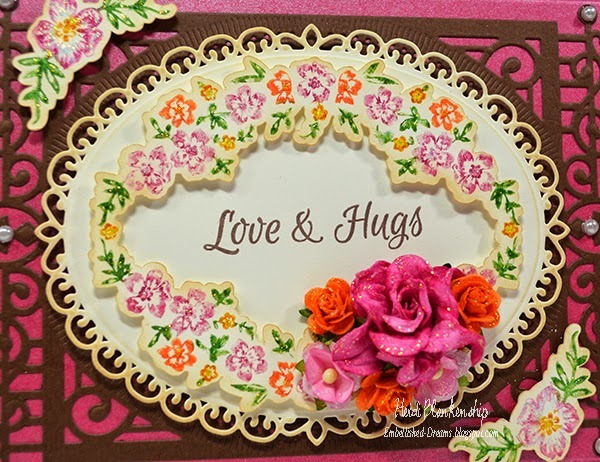 I used the exact cut file to create the large floral frame and the two small flower accents. I colored directly on the stamps using Distress Markers-Picked Raspberry, Ripe Persimmon, Spiced Marmalade, Mowed Lawn and light sprayed the stamp with a little water to reactivate the ink. Then I inked the edges of the cut pieces using Distress Ink-Antique Linen. These are a couple of close ups of the card. 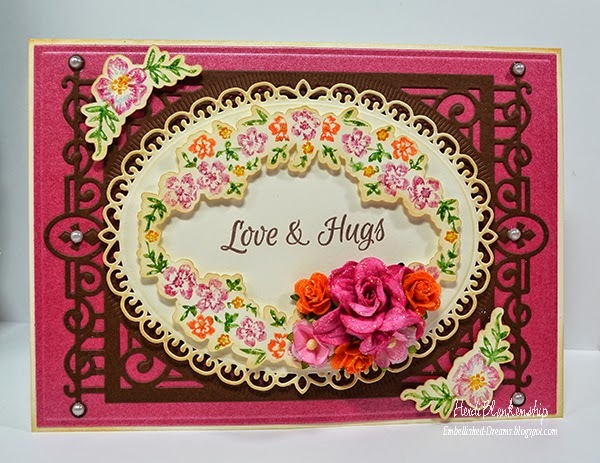 I used S6-010 5 x 7 Heirloom Legacy, S6-001 5 x 7 Matting Basics A, and S4-425 Elegant Ovals from Spellbinders Paper Arts® to create the die cuts. 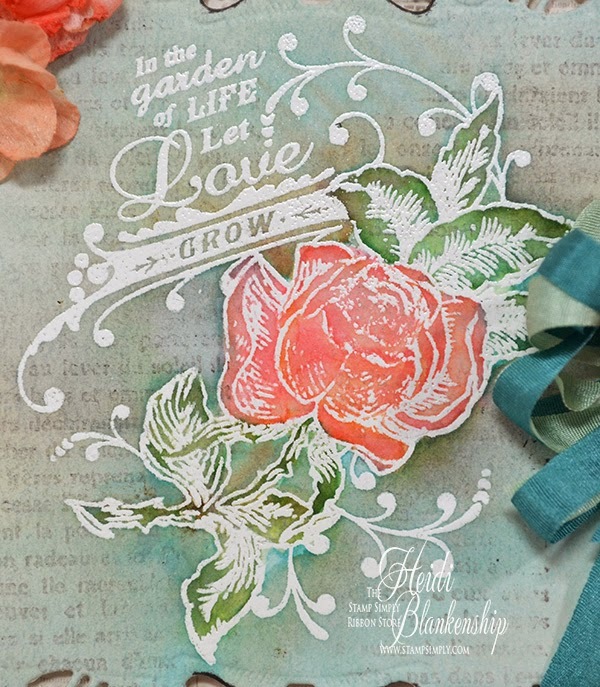 I stamped the sentiment using Rich Cocoa ink. I used 3D Foam Squares, and E-Z Runner® Permanent Strips-Refillable Dispenser 49' to layer and adhere all of the pieces together. To finish off the card I added some Ivory Flat Back Pearls from Em's Emporium and Wild Orchid Flowers. Thank you for joining us during the August New Release! I hope you enjoyed all the inspiration from the Design Team.